These days you will have to look extremely hard to find a smartphone with a removable battery. With phones getting thinner and users preferring designs with more premium feeling materials such as aluminum or glass and features like water resistance, more and more smartphone makers are ditching the removable battery. Unless you are extremely handy and willing to risk tearing apart your phone to replace your battery as its life gets shorter, or want to pay as much as $79 to have your battery replaced by the manufacturer, that expensive new $999 iPhone X has a limited lifespan. You may have noticed how with a previous phone you were once able to get through an entire day with a single charge. Then over time, you started needing to charge more often, like in the middle of the day or otherwise your phone will die before it makes it back onto your charger at the end of the day. There is only so much power saving apps can do to extend your daily battery life. Battery makers specify the lifespan of lithium-ion batteries used in phones and laptops to last between 300-500 charge/discharge cycles. If you do not want to be tethered to an outlet all the time, knowing how to extend your battery’s health is important. Here are a few tips on how to take care of your phone’s battery and prolong its life. Battery University found that environmental conditions affect battery longevity the most. The worst thing is to have a full battery while subjecting the phone to elevated temperatures. Battery University considers temperature above 86 F as elevated. This means avoid leaving your phone in a parked car in the sun during summer. If you use any CPU intensive apps (I’m looking at you, Pokemon Go! ), consider taking a break occasionally to allow the phone to cool off. If you are using a laptop, when you hear the fan come on or if the fan comes on often, check the exhaust vent to see if hot air is blowing out. If you do not feel any air, it could mean dust has clogged the opening and the heat has nowhere to go. This will cause your laptop to run hotter or overheat. Clean out the fan for best performance. If you feel the bottom of your laptop and it is hot to the touch, one thing you can do is get a laptop cooling pad, such as the Tree New Bee Cooling Pad. This laptop cooler has multiple fans to blow air at the bottom of your laptop while raising it off your lap, carpet, or your bed to promote better airflow. Lithium-ion batteries do not have a memory effect like nickel-cadmium batteries. The memory effect causes NiCd batteries to “remember” the previous capacity if they weren’t fully drained before charging. This means you can charge your phone from any percentage and get the full capacity of the battery. 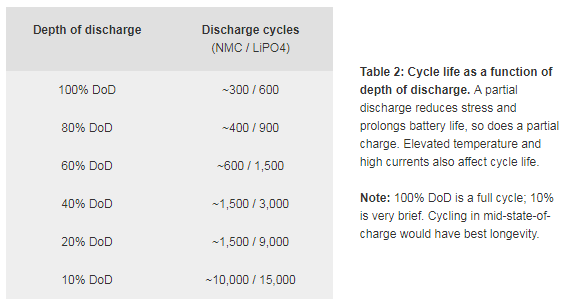 The table below from Battery University shows that when a lithium-ion battery is regularly fully discharged, it will have the lowest number of lifetime discharge cycles available. A lithium-ion battery gets the 300-500 charge/discharge cycle rating when it is fully charged to 100% every time. Battery University’s research shown in the below table found that battery longevity is the highest when it is charged to 60-65%. However most chargers for consumer electronics will charge lithium-ion batteries to 4.20 V/cell, which is 100% charged. This is because consumers want to be able to use their devices for the longest possible time between charging since there may not always be an outlet available. If you were to charge your phone to approximately 80-85%, you will almost triple your battery’s life to 850-1,500 charge/discharge cycles. Tesla limits their batteries in their cars to 4.15V/cell or 95% of full to maximize the lifetime of their battery packs. It is up to you to decide how much to charge up your battery with your daily usage. 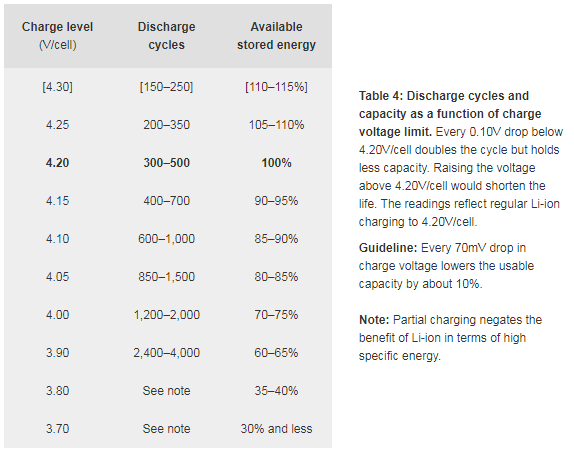 The above table also shows that should a lithium-ion battery be overcharged, its life will actually decrease. To prevent overcharging, circuitry is built-in to automatically stop charging when your phone hits 100%. Your phone will then maintain that charge by waiting until the battery level drops a bit before it starts charging again to top off the battery. To prevent your device from constantly topping off your battery while you are asleep, you can get a timer such as the Belkin Conserve Socket to stop the charging after 30 minutes, 3 hours, or 6 hours. Yes, I had just mentioned above that it is best not to fully charge or drain your battery. Battery experts recommend after about 30 partial charges, to allow lithium-ion batteries to discharge almost to empty. This is because continuously partially discharging your battery causes the power meter at the top corner of your phone to become inaccurate. Completely draining and charging your battery will recalibrate the battery gauge. 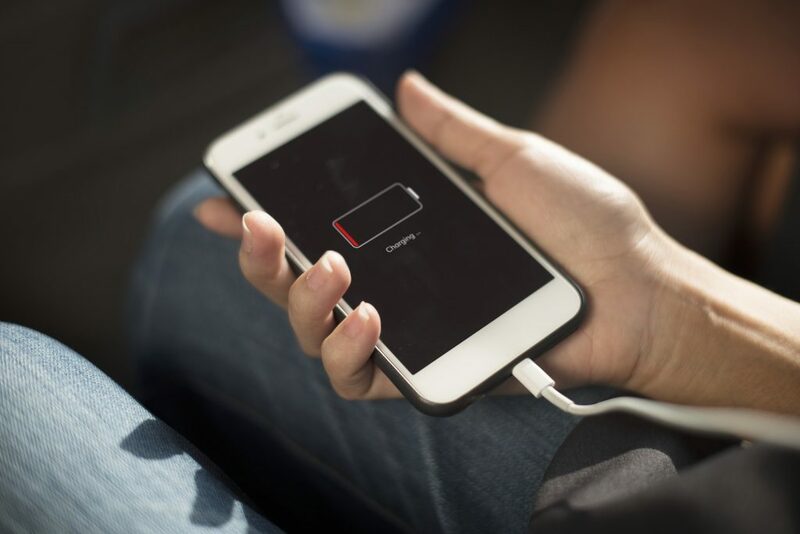 If you follow the above four basic rules – minimizing exposure to heat, charging your phone for a bit when possible, not go all the way down to empty, and occasionally resetting your battery’s calibration, your battery should last a long time. Your devices and their lithium-ion batteries are designed to prevent you from ruining them through normal use. Keep in mind that all lithium-ion batteries will die eventually, even if they aren’t used. At some point, you will either need to replace the battery; carry around a portable battery power bank to keep your device powered up; or if you are still using a Motorola Razr, it might be time for a brand new phone.